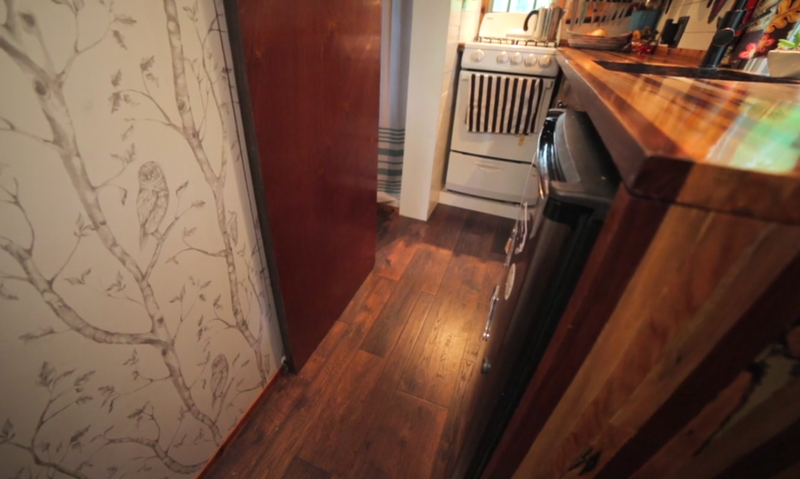 What we love most about our tiny house is how it’s tailored specifically for us. It fits like a glove. Though as time goes on, we evolve. So our home should evolve too. It’s important to feel proud of your space, especially when you live tiny. It’s like a self-portrait of your best self. It should make you smile and put you at ease. We’ve found that the smaller your living space, the bigger the look and feel of it has on your outlook. 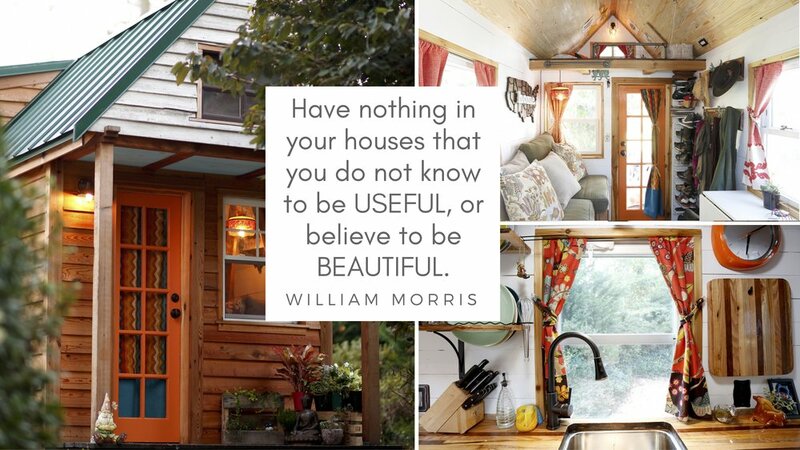 For example, when our tiny house feels dirty and cluttered, it quickly negatively affects my mood. Give me 10-15 minutes to tidy up, and it feels fresh again. When we emptied out our tiny house to install the new Pergo TimberCraft +WetProtect flooring*, our space felt like a blank slate again, full of possibilities. It seemed like the ideal time to freshen up our space. The first thing we did was repaint the walls. To match our warm white, we asked the Lowe’s paint department for Polar Bear white in semi-gloss. 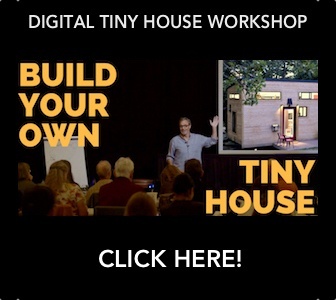 The tiny house immediately felt more open. For more on our recent floor upgrade, watch our DIY install video here. 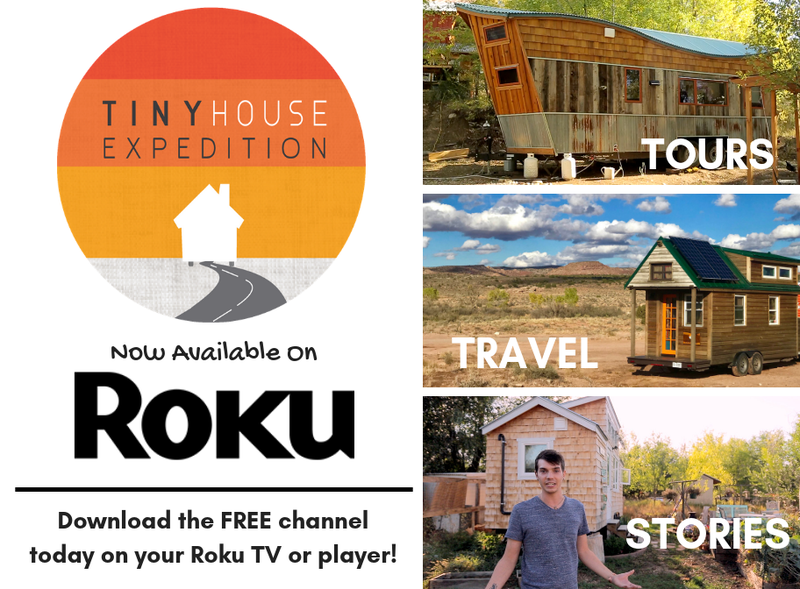 Our tiny home style has always been rustic and eclectic. It’s reflected in our vibrant curtains, live edge wood and funky knick-knacks—like my repurposed tin collection, now used to store silverware, jewelry and junk drawer type items. Our new Pergo laminate floors in Crest Ridge Hickory really bring together our patchwork wood palette with their rich, warm undertones. 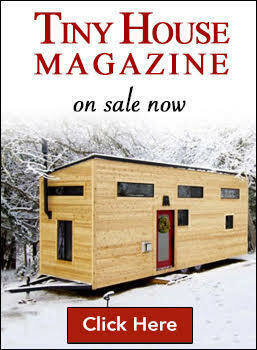 Because they look so much like hardwood, they blend right into our wood-centric tiny house. Christian also just refinished and resealed our beautiful butcher block countertops, which also adds so much to our space. Fun fact: the countertops were made from five kinds of trees that fell in a tornado behind Christian’s parents’ house in North Carolina several years ago. With the new floors now in, we were faced with a delightful challenge. How do we further rejuvenate our space to tie together the beauty of the new floors with our favorite décor elements, like my woodland creature obsession? The thing about tiny living is that you curate your space around what you most love and need. So, with any updates to our space, we kept this in mind. The goal: freshen up our three-year-old tiny space, create an even cozier reflection of our personalities and style, and have fun doing it. As we’ve done a million times in the past, especially during our build, we headed to Lowe’s in search of décor solutions. We’ve been dying for a central light fixture for our living area. Our old ceiling fan/light bit the dust after our first year of travel. Since then we haven’t been able to find the right light. As we wandered the store, we came across the most adorable succulent planters. I’ve always had a soft spot for whimsical décor elements. Also, adding a touch of green is an enchanting way to literally breathe new life into our tiny home. Though, my favorite new find is definitely the woodland inspired wallpaper. It is the lightest shade of blue with owls and woodpeckers perched on aspen trees; it perfectly blends with the playfully rugged feel of the rest of the house and complements the colors found in our curtains and new pillows. Seriously, it makes my heart happy. As you style your home, whether tiny or large, aspire for décor that makes you smile on a daily basis. And for the record, Christian loves it too! 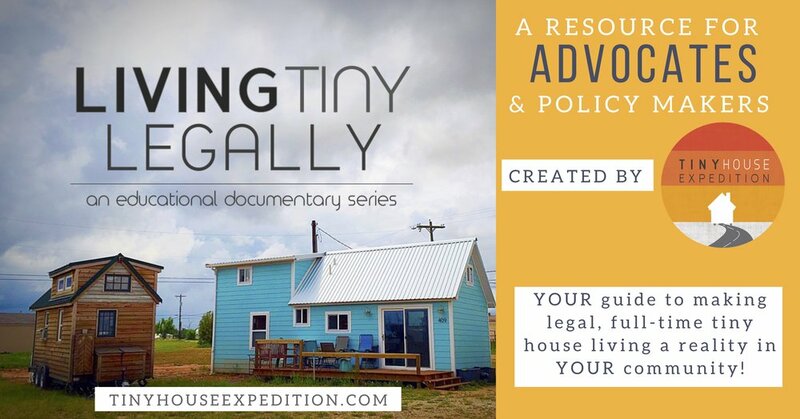 There is no one right amount of stuff you should or shouldn't have in a tiny house. Just make sure you love those things, or that they help you achieve your daily or long-term goals. By setting an intention to your living space and the simple life, you can find joy. Tiny bits of daily joy. We’re amazed at how our new Pergo floors- with a slight, but impactful, décor update- have made our tiny house feel brand new again. We fell in love with it all over again. Remember, you can order a sample of TimberCraft +WetProtect floors online. How would you decorate your tiny space? Let us know in the comments below.